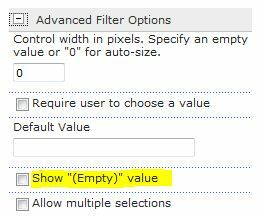 I have been using the SharePoint List Filter Webpart a lot this week and one thing annoyed the living hell out of me… there is no option to reset the filter. So, once the filter is set… you need to reload the page to undo it. Not nice, right. Did some searching on the internet and the only thing I found was people telling to add a “reset” link on the page which refers to the page itself so the user actually reloads it. Then I noticed the “Advanced Filter Options” in the WebPart properties pane. I never gave this much attention. And yes, one of the options in that collapsed pane is ‘Show “(Empty)” value’. This will add “(Empty)” to the top of your list and acts as a reset.